Chef on the Farm: How to bring New Orleans into your home and host an amazing crawfish boil! Set a date and invite friends and family! The most important step - Order the (LIVE) crawfish! Louisiana Crawfish Company makes it easy to order online and pick up at the airport, with as little as 2 days notice. You want to order 2-3 lbs of crawfish per person eating. Have them delivered a day in advance so you can purge the crawfish ahead of time. We're not affiliated with Louisiana Crawfish Co. at all, but want to give them a big shout-out to them for their hard work & excellent customer service, Thank you! When your mudbugs arrive (the day before your party), it's time to purge. All you really need to do here is submerge them in fresh water for 12-24 hours. So, Saturday evening I separated the crawfish into 2 totes and filled it up with water from the hose. Easy peasy - they'll be good to go until the next day. Just make sure your lid is on tight! 80-Quart Aluminum Stockpot with Boil Basket - we upgraded to this 100-quart Pot last year. Trust me, you'll need a big one! Outdoor Gas Cooker, Propane. And the propane tank to go with it - you probably already have one for the grill! Crawfish Stir Paddle - the must have crawfish cooking accessory. Konriko Crab Boil - We choose this one from Amazon because we like the short list of ingredients with no added MSG or fillers. If you order from Louisiana Crawfish Co, they can send you boil seasoning with the order. ZATARAINS Crab and Shrimp Boil Liquid - A little of this goes a long way - use sparingly until the boil is spicy enough for ya. It's Boil Time! Fill up your boil pot halfway with water. Put in on the burner and fire up the heat. Cut off the tops of garlic heads and add to the pot along with baby potatoes. Wait a couple minutes then add lemons, corn cobs and onions and cajun seasoning. Boil for about 8 minutes. Add mushrooms & sausage, boil for additional 2 minutes. Drop in your first batch of crawfish, making sure not to overcrowd the pot. Bring back up to a boil then put the lid on and hold it there for 4 minutes. At this point, turn off the heat and let it rest for 2-4 minutes. Carefully remove the lid and let it cool for 10 min. Add half a bag of ice and let it cool for 5 more min. Stir every once in a while. Set off to the side and let the liquid drain before serving. Eat up! Spread newspaper out on a table and pour out your first batch of (drained) crawfish. At this point you might have a bunch of confused onlookers staring at the pile of crawfish not knowing what to do. 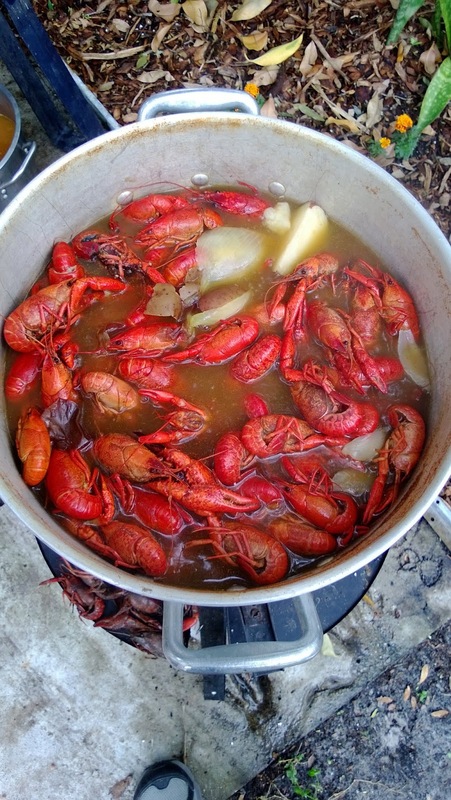 Start the party yourself and be the first one to dive in -peeling crawfish is super easy, once you get the hang of it! Hold the head with one hand and the tail with the other. Twist and pull the head from the tail. his is the best part - sucking the heads! Take a deep breath now, you're not really sucking out the brains - I promise! Be brave and try it at least once! Toss the head in the trash pile. Peel off the first 2 or 3 rings from the tail. Pinch the end of the tail while you pull the meat from the shell. Repeat steps 1 - 5! Need a few ideas of what else to serve at your crawfish boil? Click here to get Chef John's recipes for his famous Collard Greens & Cajun Red Beans & Rice! Posts may contain affiliate links. If you purchase a product through an affiliate link, your cost will be the same but Chef on the Farm will automatically receive a small commission. Your support is greatly appreciated and helps us feed our chickens!